13.3.2018 European Values . Téma: Kremlin Watch Briefing. In recent months, our team has been trying to enhance and adjust our weekly newsletter to better accommodate the needs and wishes of our readers. In order to evaluate our effort, we would like to kindly ask you to fill out this questionnaire. Filling it out will not take more than 10 minutes and the results will tell us if there is something that could still be improved and which parts of our product are useful for you. Social media companies should have national offices in order to better understand local environments and norms. This would prevent their making mistakes while working to avert the spread of disinformation and hate speech on their platforms. A new groundbreaking study about fake news on Twitter reveals that lies spread remarkably faster than truth, reach more people, and penetrate deeper into the social network. Perhaps most notably of all, the study finds that humans as opposed to bots are primarily responsible for this trend. Europe as presented on Russian TV: horrifying, dangerous, terrorist attacks daily, in economic decline. Why do KGB agents always work in groups of 3? One can read, another can write, and the last one serves to keep an eye on the two intellectuals. Social media companies, sometimes pressured by national governments and other times out of a voluntary sense of social responsibility, are trying to tackle the problem of disinformation and hate speech in their content. A few days ago, Facebook removeda video posted by János Lázár, the chief of staff of Hungarian Prime Minister Viktor Orbán. In that video, he says that there are no “white Christians” left in some Viennese neighbourhoods and that Budapest might end up the same way. Facebook explained that the video violated community standards, but reversed its decision and allowed the video to gain traction just a few hours later, allegedly because it was “newsworthy”. How do the French plan on tackling disinformation? The French government is working on drafting the new bill that will address disinformation in the media, especially during the pre-election period. Le Mondereports new details about what has been included in the draft so far. Apart from the new option for the government to request a court order in real time to remove disinformation during elections and added pressure on social media companies to report and flag disinformation, it also forces these tech firms to disclose funding of election-related content and permits the suspension of foreign state-controlled broadcasting during elections. A fake story is far more likely to go viral than a real story. On average, a fake story reaches 1,500 people six times quicker than a real one. Fake stories outperform the truth on every subject (including business, terrorism and war, science and technology, and entertainment), but fake news about politics consistently does the best. Mother Jones reports the findings of a study that reveals how Russian news outlets exploited the debate over genetically modified foods in the US. While the majority of scientists have deemed GMOs safe for human consumption, many Americans don’t agree – a 2015 poll found that 57% of the US public considers GMOs unsafe to eat. Wanting to understand the root causes of these attitudes, the researchers analyzed articles containing references to GMOs from news outlets across the US political spectrum (Breitbart, Fox, CNN, HuffPost, and MSNBC), as well as RT and Sputnik. They found that the two Russian sites produced more content on GMOs than all the other outlets combined. 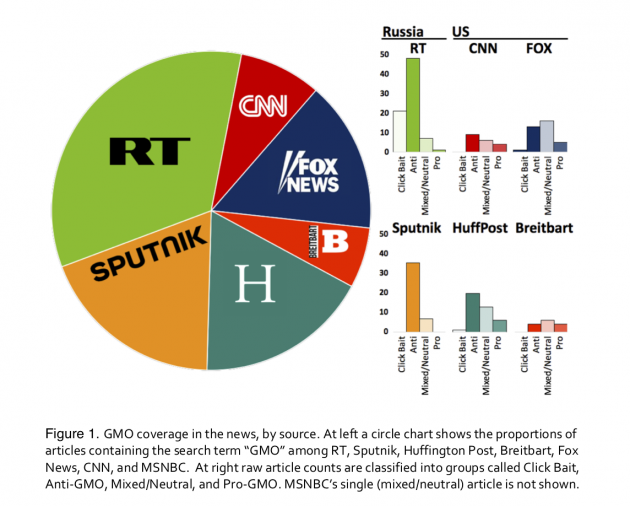 While GMOs are controversial in the US, they are not a source of political polarization in the same way as other topics Russian media and trolls exploit (e.g., race, gun reform, etc.). In this case, the anti-GMO coverage is likely driven by Russia’s established opposition to GMOs and the fact that they are a predominantly American agricultural innovation. After all, the Kremlin couldn’t possibly condone support for an American accomplishment! Last week we wrote about Putin’s pompous presentation of new weaponry, which RT called “cutting-edge weapons systems”. Putin ended his announcement speech by saying, “Nobody wanted to talk to us about the root of the problem. Nobody listened to us; so listen now!” Later, Russian media and Putin himself tried to tone this rhetoric down a bit, stating that Russia isn’t initiating a new arms race but is “calling for peace and talks”. Nota bene, this is so Russian: announcing a new-age destruction weapon but claiming to want peace talks! Let’s be honest, Putin wanted Western countries to approach to him and negotiate terms acceptable for Russia. Even more so, he wanted to inspire fear of Russia and its new weaponry. While reasonable voices pointed out the bravado of the display, some leaders in the West quickly gave Putin exactly the validation he wanted. RT happily shared a letter signed by US Senators that called for urgently engaging with Russia. “A US-Russia Strategic Dialogue is more urgent following President Putin’s public address on March 1st when he referred to several new nuclear weapons Russia is reportedly developing, including a cruise missile and a nuclear underwater drone… the United States should urgently engage with Russia to avoid miscalculation and reduce the likelihood of conflict”, says the letter. Of course, trying not to look too pleased that someone else was doing RT’s job of reiterating the Kremlin’s narratives, RT criticized the authors of the letter for failing to list American shortcomings. Nevertheless, Kremlin media outlets eagerly promote every single speech that fits the Kremlin’s intentions: now you come and talk to us but on our terms. Our reading suggestion this week is an analysis by the Ukraine Crisis Media Center, offering numerous interesting facts about the current state of Russian TV and, most importantly, about how EU and Eastern Partnership countries are depicted in its coverage. The authors point out that TV is the main instrument of public opinion formation in Russia. The average daily time of individual TV viewership in Russia is more than 4 hours, and since international events constitute an abnormally large share of Russian news programs, the impact on the public’s views of foreign countries is significant. Through analyzing the top Russian TV channels for three and a half years, the authors compiled a list of key narratives about EU and EaP countries, which, unsurprisingly, are not very flattering. Europe is consistently portrayed as a horrifying place, where dangers come unexpectedly but constantly from different sides. Terrorist attacks are happening on a daily basis, millions of refugees are displacing locals, and the sanctions against Russia (imposed by the United States and beneficial only there) are badly hurting the European economy. Moreover, Europe is allegedly falling apart, and Russia has to be aggressive in ensuring that Europe does not impose its perverted values within the country. Take a look to find out more! Subscribe to Kremlin Watch Briefing!